With Tony Nese defeating Buddy Murphy to capture the Cruiserweight Championship at WrestleMania, and Mike and Maria Kanellis hijacking the 205 Live Twitter account for some fun and games at General manager Drake Maverick’s expense, it’s been a fun few days for the purple brand. 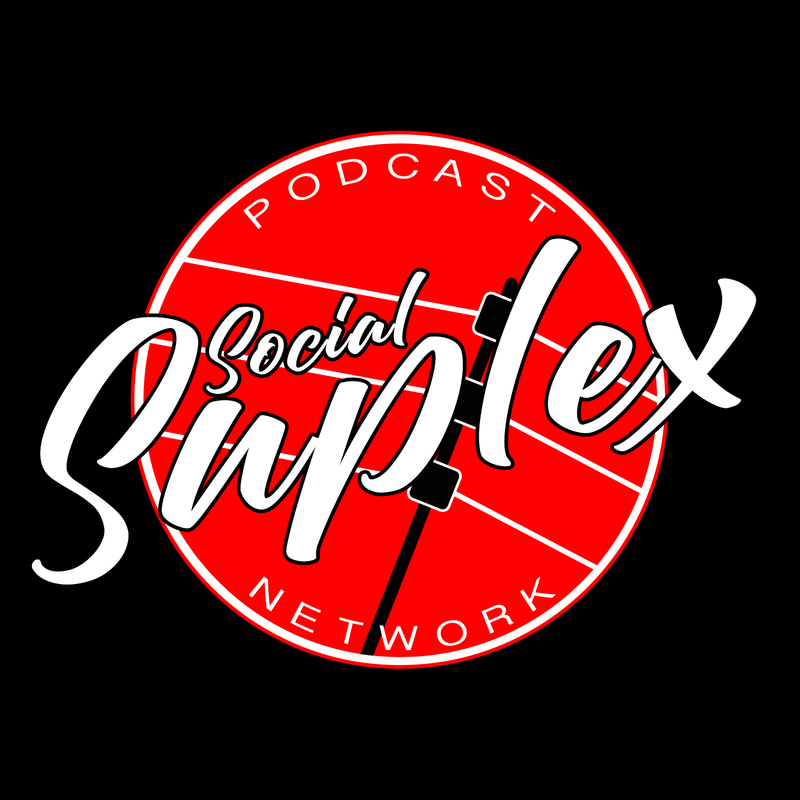 The first show of the “wrestling new year” keeps the drama going. Nese’s title reign is immediately put to the test in a rematch with his WrestleMania opponent, Buddy Murphy. Elsewhere on the show, Jack Gallagher will look to teach Humberto Carillo a lesson in his ongoing mentorship in singles action. Vic Joseph, Nigel McGuinn’s as, and Alden English provide the commentary for the evening. It will certainly be interesting what comes out of this match. 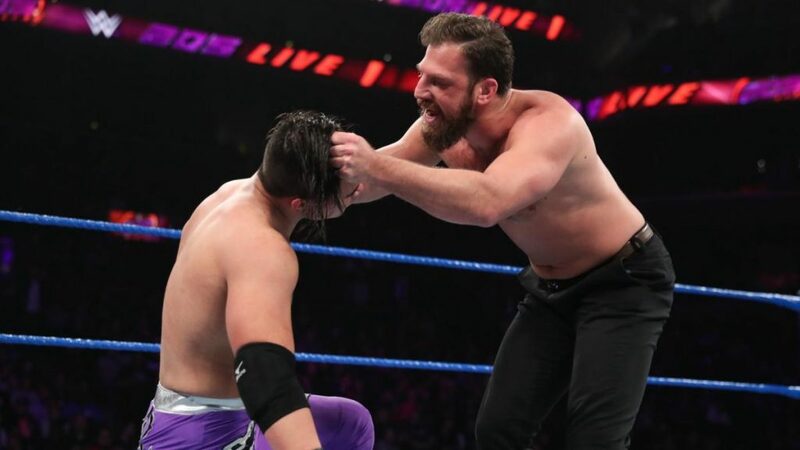 What better way than for Gulak to teach his student the ways of the world than facing off against a graduate in Jack Gallagher? The making of Humberto Carillo is still some way off. However, this baptism by fire could speed things along considerably. Drew Gulak joins the commentary team for the match, as Gallagher starts things off in typical catch wrestling style. Carillo reverses a wrist lock with a flip of Gallagher onto the floor, but the Gentleman can “Houdini” himself to safety quickly. Gallagher goes for a monkey flip, but Carillo lands deftly on his feet to the appreciation of the crowd. The teacher versus pupil dynamic is heavily leaned upon in this match. Moves are echoed, sometimes superseded. Gallagher has to change his game to a more smash mouth offense. Carillo is faring well, all things considered. Gallagher’s claustrophobic pressure is starting to wear his opponent down, however. Carillo fights out of an Ascot lock, throwing punches to fend off Gallagher. He runs the ropes and, unfortunately, eats a high dropkick, allowing Gallagher a pinfall attempt. Gallagher straddles Carillo, laying in heavy forearms. He taunts the crowd with a gentleman’s wave before dropping an elbow atop Carillo’s chest. Gallagher is toying with his opponent now, taking time to flaunt his prowess. Carillo musters some strikes eventually. A back and forth ensues. Carillo strings together some high flying and, surprisingly for him, impacting offense. It culminates in an impressive flip over the ropes, crushing Gallagher on the outside. Gulak is frustrated with Carillo’s tactics, berating him while still on the headset. Despite the alliance, Gulak wants Carillo to get the job done; no more frills and crowd pandering. Carillo dismisses Gulak, kicks an incoming Gallagher, and leaps from the top rope. A dropkick to Gallagher’s head keeps momentum on his side. With Gallagher prone by the ropes, Carillo charges towards him, handstand springboards, and brings Gallagher with him for an arm drag. Very impressive stuff from Carillo here. Even Gulak can’t be mad with how graceful yet successful Carillo’s move set is, surely? Aiden English mentions this on commentary. Gulak answers with stubborn silence. Carillo climbs the ropes to finish the job. Gulak, however, has other plans. He pushes Carillo from the turnbuckle, who falls to the mat. The referee calls for the bell, as Carillo defeats Gallagher by disqualification. Buddy Murphy is warming up backstage. He concedes the fact that Nese was able to stop the Unstoppable. But tonight, he’ll prove that he is still the greatest Cruiserweight of all time, when he gets his championship back. Elsewhere, Tony Nese is holding the purple belt with reverence. He says WrestleMania was the greatest dream of his life, fighting for a dream that he made a reality in front of all his friends and family. He says that Murphy will never take this title from him, that he’s proud to be a fighting champion. He finishes by stating he will once again stop the Unstoppable. 205 Live General Manager is up next, talking to Oney Lorcan. He wants to talk about next week. Before that, Cedric Alexander interrupts. Alexander wants a rematch against Lorcan. This is confirmed for next week. Lorcan tells Alexander that “to be the man, you gotta beat the man”, something he will do next week. Should be a good one! 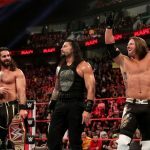 Sadly, the title match at WrestleMania had the pre-show treatment of having commercials spliced into the majority of the screen during their match. In a two hour broadcast, this always pains me. With 205 Live episodes usually having plenty of time, tonight should be a more fleshed out iteration of what occurred on Sunday. The Cruiserweight Championship is covering up The Premier Athlete’s abs. His beaming smile tells me this doesn’t bother him. Nese is clearly proud of his accomplishment. Here’s hoping a successful retention tonight will amplify that pride. After the in-ring tale of the tape, the match gets under way. Despite having the hometown(ish) advantage, Tony Nese chants are less loud than the Murphy ones. The initial collar and elbow is a long exchange; a battle of strength and wills, perhaps. Murphy has the advantage in the early exchange. He is none too pleased at losing his championship. Nese works his way out of a chin lock and powers through Murphy. He mocks him for being the supposed Unstoppable. 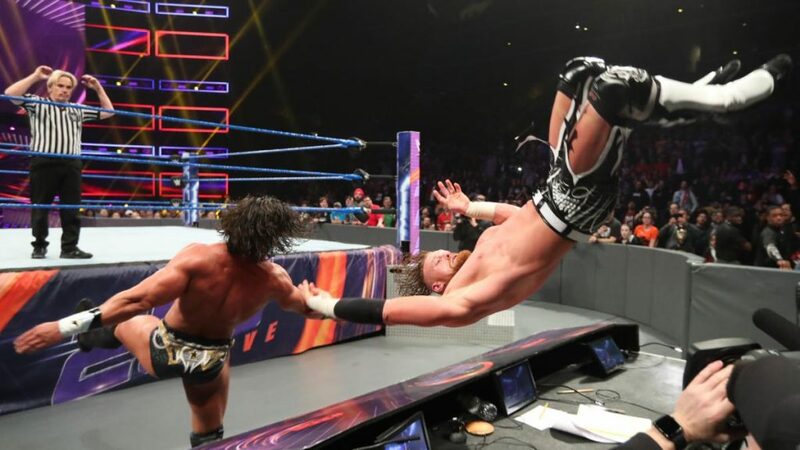 Nese’s evasion of Murphy’s attacks are flawless. Flips, nip-ups, ducks. You name it, Nese has it covered. Nese charges Murphy who vaults out of the way. He seemingly lands badly on his knee. The referee asks Nese to stay back, allowing him to check on Murphy. Now, cast your mind back to when Murphy feigned a knee injury in Humberto Carillo’s debut match. Well, history has repeated itself. I saw the writing on the wall the instant it happened. Nese, sadly, did not (sigh – silly trusting babyfaces). Murphy strikes with Nese’s back turned and lays into him, ramming him shoulder first into the corner stanchion, then throwing him about like a sack of potatoes on the outside. Murphy rolls Nese in for a quick and desperate cover. Unsuccessful, Murphy is in full rage mode. Launching him out of the ring. Sprinting and somersaulting over the ropes. A huge meteora onto Nese. The Premier Athlete is in danger. Nese’s resolve pulls him through, however. Murphy takes to the top rope again, but Nese revives and launches Murphy onto the fan barrier from an open palm strike. Murphy is rocked by the sudden comeback. This time, it’s Nese’s turn to take to the skies. A fosbury flop takes out Murphy, who then receives multiple crashes into the barrier for his troubles. The onslaught continues. Nese rains Murphy’s head down on the commentary table. Just when you think he’ll throw Murphy back in the ring to stop the ref’s ten count, Nese swivels round and launches Murphy full force into the now vacated seating area for Joseph, McGuinness, and English. Nese is now a man possessed, looking to destroy Murphy once and for all. The pair struggle with each other on the top rope, but Nese gains the upperhand. An enziguri and a frankensteiner later, and Murphy is wobbling about on jelly legs. Gasping for breath, Murphy grabs Nese, but Nese hauls him close for a strike. Murphy, tangled in the ropes, falls victim to a springboard moonsault onto Murphy. A two count follows. Nese is looking frustrated, but not looking ready to give up. A pump handle driver by Nese, but Murphy kicks out at two. Murphy is hanging on by a thread. This is an emphatic display by Nese. Again! Nese scales the turnbuckle with Murphy underneath him, looking to rain punches down on his opponent. Murphy slips free, however, trapping and then crushing Nese’s head with a superkick. He has Nese up for a powerbomb. He walks to the centre, and drives him down to the mat. The champion kicks out in the nick of time. Murphy is up first. He locks hands with Nese and goes for a knee. Nese catches it, however. Following some hard strikes, Nese suplexes Murphy into the corner. They now find themselves on the apron. After a back and forth, Murphy stalks backwards, then charges forward with a devastating knee. Nese turns inside out as he flops to the floor outside. Murphy is eyeing up the commentary table now. The Juggernaut looks for a powerbomb, but Nese is dead weight. He looks out for the count. Murphy has to break the ten count to ensure he has a chance of beating Nese. He slides back out but is monkey tossed by Nese onto the table. “Holy S***” chants ring out from the eager crowd. This. Is. Chaos. Balls to the wall action. This time, Murphy is close to losing from a ten-count. He comes in as the referee is about to raise his hands for the last time. Exhausted, battered, bruised, Murphy and Nese level strikes at each other. Murphy wins this exchange, clotheslining Nese inside out. A follow up shoulder bomb twister splash (no clue what this move is called – this will have to do!). Murphy, having delivered his finishing Murphy’s Law, goes for the cover. Nese kicks out with nanoseconds to spare. The crowd are elated. Murphy, understandably, quite the opposite. He grabs Nese and hammers him with repeated knees to the face. He looks to follow up with a suplex, but Nese reverses it with a reverse rana. Murphy’s head is well and truly spiked onto the mat. Nese rolls down his knee pad and heads to the adjacent corner. He hits Murphy with the Running Nese, but he is not finished. He walks back again, and charges. A leaping Running Nese is the final nail in the coffin for Murphy. The referee could count to one hundred if he wanted. Nese retains. Nese puts in another superb performance. Nese further cements his chances at being 2019’s MVP. An outstanding match, significantly better and more hyperactive than their WrestleMania offering. I could give this plaudits all day. Sadly, however, I am on holiday this week and have to get back to it. My time with WWE this week has been delayed, and few and far between. This week of all weeks, right? Congratulations to Tony Nese. 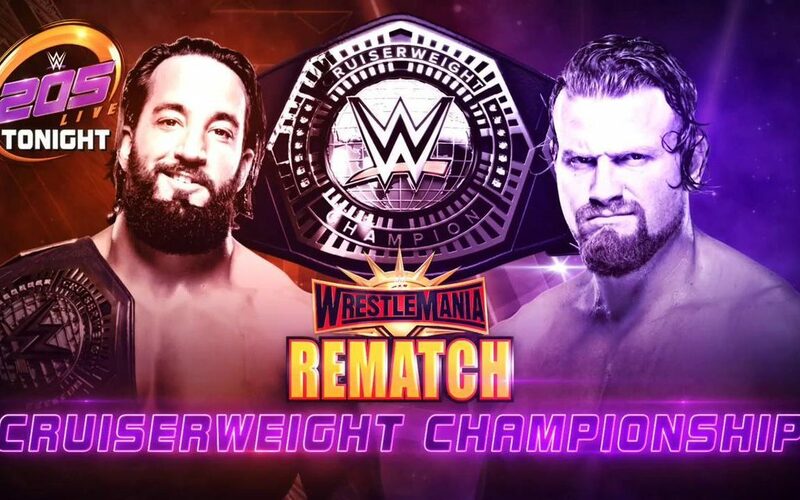 Not only on securing the “big purple” at the Show of Shows, but retaining it in superlative fashion with a surefire contender for one of the 205 Live matches of the year! Our latest Ricky And Clive Wrestling Show podcast is now available for download, where NXT Takeover: New York, and WrestleMania 35 are broken down in detail.